Stansted Airport is the main international airport near Cambridge with regular flights from many European destinations. There is a regular train service between Stansted and Cambridge that takes about 30 minutes. Luton Airport is about 40 miles (65 km) from Cambridge. There is no train connection from Luton Airport to Cambridge, but there is a National Express coach service departing from just outside the terminal building. It takes about 1.5 hours to reach Cambridge. London Heathrow Airport and Gatwick Airport are located just over 2 hours by train from Cambridge. There is a fast and frequent rail service from London King’s Cross and London Liverpool Street through to Cambridge. There are excellent connections from Scotland & the North via Peterborough, and regional services from Birmingham & the Midlands, East Anglia, and the Northwest. Taxi: Churchill College is a 15-minute taxi ride from the train station. A taxi rank is located just outside the station. Please note: There is no exit southbound at Junction 13 on M11. See directions below for A14 (from the north west). At the end of the slip road, turn right onto Madingley Road. Continue toward the City Centre. Pass the Cavendish Laboratory on the right, followed by the college playing fields on the left. Take the next left turning onto Storey's Way. Churchill College is on the left-hand corner of the site. Drive past the front of the college. Take the first turning on the left, which has a sign that reads "Churchill Road, Private Road". Follow the directions below for parking. After the blue pedestrian bridge, exit the A428, crossing the roundabout onto the A1303 signed for Cambridge. Pass the American War Cemetery on your left and continue toward the City Centre, crossing the M11. Pass the Cavendish Laboratory on the right, followed by the college playing fields on the left. Take the next left turning onto Storey's Way. Churchill College is on the left-hand corner of the site. Drive past the front of the college. Take the first turning on the left, which has a sign that reads: "Churchill Road, Private Road". Follow the directions below for parking. Take the third exit signposted for Cambridge. At the top of the slip road, take the first exit signposted Cambridge (B1049). Follow this road for approximately 2 km, reaching the T-junction at the end. Turn right and immediately right again through two sets of traffic lights. You are on the A1307 heading toward Huntingdon. After passing Murray Edwards (off-white) and Fitzwilliam (brown) colleges and some playing fields on the left, and just before a set of pedestrian traffic lights, turn left onto Storey's Way. Pass through the width restriction on the first bend. After the next sharp bend, turn right onto Churchill Road, Private Road. Follow the directions below for parking. Take junction 31 off A14 (just as it meets the M11). Follow signs to Cambridge along A1307, keeping in the right-hand lane. Continue toward Cambridge City Centre, traveling along Huntingdon Road. Pass Girton College and Hotel Felix on your left. After the second set of traffic lights, turn right into Storey's Way. Pass through the width restriction on the first bend. After the next sharp bend, turn right onto Churchill Road, Private Road. Follow the directions below for parking. Churchill Road Visitor parking is available along the right-hand side of Churchill Road and in the car park at the top, past the Møller Centre car park. We recommend that conference attendees stay at the Churchill College site. Please note that onsite accommodation is limited, so we recommend booking as early as possible! Click on the link above and enter KX47265 in the Promotion/event code box. Once the code is entered, you’ll be able to select the Conference dates and to proceed with your booking. Alternatively, click here for a list of nearby hotels. We recommend you book as early as possible, as hotels in Cambridge will be busy in September. Why not extend your stay after the conference and explore what this historic city has to offer? Get lost down the medieval cobbled streets; visit one of the many museums and art galleries; and, of course, explore the university. 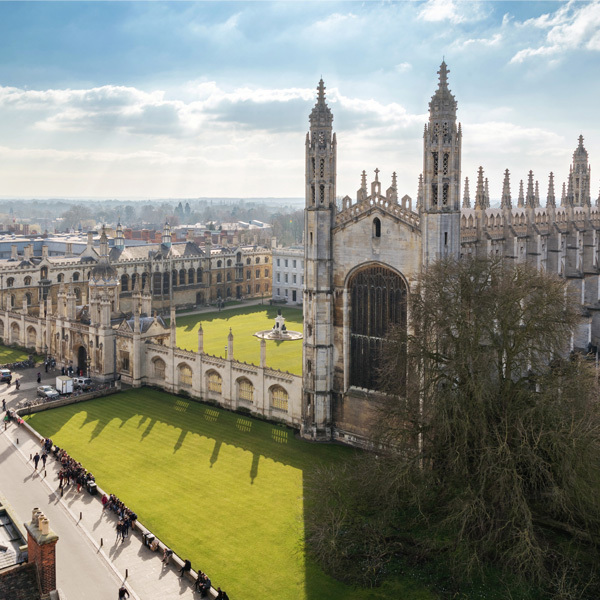 Download our guide to Cambridge attractions here. Get ready to connect, learn, and innovate. Join the top minds in science, physics, and engineering for three days of learning, talks by industry experts, and presentations featuring cutting-edge R&D.